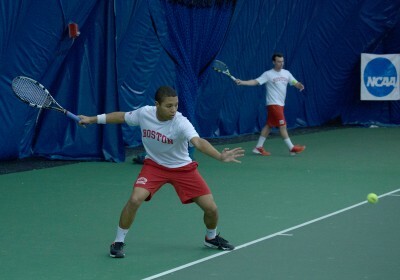 The Boston University men’s tennis team improved to 4-3 on the season with a 4-3 victory at the Massachusetts Institute of Technology Friday night. The Terriers were led by junior Jay Leelavanich, who won the top singles spot as well as the top doubles spot with classmate Jake De Vries. Down 3-2 with only the final two singles slots left to play, freshmen Satyajit Simhadri and Jeff Chan stepped up and led the Terriers to victory. Both freshmen coasted to two-set victories, sealing the win for BU. BU will travel to Quinnipiac University Saturday for its next meet. The BU men’s and women’s track and field teams hosted the Last Chance Meet at the Track and Tennis Center Sunday, giving the athletes a final chance to qualify for the NCAA Championships. In order for athletes to qualify for nationals, athletes needed to finish with one of the top 16 results in the country. Junior Cameron Williams, who is the school record holder in the 200-meter and ran the fifth-fastest time in the nation at last week’s Patriot League Championships, is the lone Terrier to qualify for the NCAA Indoor Track and Field Championships. Junior David Oluwadara narrowly missed qualifying, as his season best triple fell .01 meters short of the 16.07 meters needed to qualify. Freshman Alexander Seal won the 800-meter in his first time ever competing in the event, but he fell less than two seconds short of qualifying for nationals. For the women’s team, Patriot League pentathlon winner and senior Catherine Sampson finished second in the high jump. Meanwhile, freshman Sarah Cicchetti won second place in the weight throw.